Leopold Anthony Stokowski (18 April 1882 – 13 September 1977) was an English conductor of Polish and Irish descent. One of the leading conductors of the early and mid-20th century, he is best known for his long association with the Philadelphia Orchestra and his appearance in the Disney film Fantasia. He was especially noted for his free-hand conducting style that spurned the traditional baton and for obtaining a characteristically sumptuous sound from the orchestras he directed. Stokowski was music director of the Cincinnati Symphony Orchestra, the Philadelphia Orchestra, the NBC Symphony Orchestra, New York Philharmonic Symphony Orchestra, the Houston Symphony Orchestra, the Symphony of the Air and many others. He was also the founder of the All-American Youth Orchestra, the New York City Symphony, the Hollywood Bowl Symphony Orchestra and the American Symphony Orchestra. Stokowski conducted the music for and appeared in several Hollywood films, most notably Disney's Fantasia, and was a lifelong champion of contemporary composers, giving many premieres of new music during his 60-year conducting career. Stokowski, who made his official conducting debut in 1909, appeared in public for the last time in 1975 but continued making recordings until June 1977, a few months before his death at the age of 95. The son of an English-born cabinet-maker of Polish heritage, Kopernik Joseph Boleslaw Stokowski, and his Northampton-born wife Annie-Marion (née Moore), Stokowski was born Leopold Anthony Stokowski, although on occasion in later life he altered his middle name to Antoni, per the Polish spelling. There is some mystery surrounding his early life. For example, he spoke with an unusual, non-British accent, though he was born and raised in London. On occasion, Stokowski gave his year of birth as 1887 instead of 1882, as in a letter to the Hugo Riemann Musiklexicon in 1950, which also incorrectly gave his birthplace as Kraków, Poland. Nicolas Slonimsky, editor of Baker's Biographical Dictionary of Musicians, received a letter from a Finnish encyclopaedia editor that said, "The Maestro himself told me that he was born in Pomerania, Germany, in 1889." In Germany there was a corresponding rumour that his original name was simply "Stock" (German for stick). However, Stokowski's birth certificate (signed by J. Claxton, the registrar at the General Office, Somerset House, London, in the parish of All Souls, County of Middlesex) gives his birth on 18 April 1882, at 13 Upper Marylebone Street (now New Cavendish Street), in the Marylebone District of London. Stokowski was named after his Polish-born grandfather Leopold, who died in the English county of Surrey on 13 January 1879, at the age of 49. The "mystery" surrounding his origins and accent is clarified in Oliver Daniel's 1000-page biography Stokowski – A Counterpoint of View (1982), in which (in Chapter 12) Daniel reveals Stokowski came under the influence of his first wife, pianist Olga Samaroff. Samaroff, born Lucy Mary Agnes Hickenlooper, was from Galveston, Texas, and adopted a more exotic-sounding name to further her career. For professional and career reasons, she "urged him to emphasize only the Polish part of his background" once he became a resident of the United States. He studied at the Royal College of Music, where he first enrolled in 1896 at the age of thirteen, making him one of the youngest students to do so. In his later life in the United States, Stokowski would perform six of the nine symphonies composed by his fellow organ student Ralph Vaughan Williams. Stokowski sang in the choir of the St Marylebone Parish Church, and later he became the assistant organist to Sir Walford Davies at The Temple Church. By age 16, Stokowski was elected to a membership in the Royal College of Organists. In 1900, he formed the choir of St. Mary's Church, Charing Cross Road, where he trained the choirboys and played the organ. In 1902, he was appointed the organist and choir director of St. James's Church, Piccadilly. He also attended The Queen's College, Oxford, where he earned a Bachelor of Music degree in 1903. In 1905, Stokowski began work in New York City as the organist and choir director of St. Bartholomew's Church. He was very popular among the parishioners, who included members of the Vanderbilt family, but in the course of time, he resigned this position in order to pursue a career as an orchestra conductor. Stokowski moved to Paris for additional study in conducting. There he heard that the Cincinnati Symphony Orchestra would be needing a new conductor when it returned from a long sabbatical. In 1908, Stokowski began a campaign to win this position, writing letters to Mrs. Christian R. Holmes, the orchestra's president, and travelling all the way to Cincinnati, Ohio, for a personal interview. Stokowski was selected over the other applicants, and took up his conducting duties in late 1909. That was also the year of his official conducting debut in Paris with the Colonne Orchestra on 12 May 1909, when Stokowski accompanied his bride to be, the pianist Olga Samaroff, in Tchaikovsky's Piano Concerto No. 1. Stokowski's conducting debut in London took place the following week on 18 May with the New Symphony Orchestra at Queen's Hall. His engagement as new permanent conductor in Cincinnati was a great success. He introduced the concept of "pops concerts" and, starting with his first season, he began championing the work of living composers. His concerts included performances of music by Richard Strauss, Sibelius, Rachmaninoff, Debussy, Glazunov, Saint-Saëns and many others. He conducted the American premieres of new works by such composers as Elgar, whose 2nd Symphony was first presented there on 24 November 1911. He was to maintain his advocacy of contemporary music to the end of his career. However, in early 1912, Stokowski became frustrated with the politics of the orchestra's Board of Directors, and submitted his resignation. There was some dispute over whether to accept this or not, but, on 12 April 1912, the board decided to do so. Two months later, Stokowski was appointed the director of the Philadelphia Orchestra, and he made his conducting debut in Philadelphia on 11 October 1912. This position would bring him some of his greatest accomplishments and recognition. It has been suggested that Stokowski resigned abruptly at Cincinnati with the hidden knowledge that the conducting position in Philadelphia was his when he wanted it, or as Oscar Levant suggested in his book A Smattering of Ignorance, "he had the contract in his back pocket." Before Stokowski moved into his conducting position in Philadelphia, however, he sailed back to England to conduct two concerts at the Queen's Hall in London. On 22 May 1912, Stokowski conducted the London Symphony Orchestra in a concert which he was to repeat in its entirety 60 years later at the age of 90, and on 14 June 1912 he conducted an all-Wagner concert that featured the noted soprano Lillian Nordica. While he was director of the Philadelphia Orchestra, he was largely responsible for convincing Mary Louise Curtis Bok to set up the Curtis Institute of Music (13 October 1924) in Philadelphia. He helped with recruiting faculty and hired many of their graduates. Stokowski rapidly gained a reputation as a musical showman. His flair for the theatrical included grand gestures, such as throwing the sheet music on the floor to show he did not need to conduct from a score. He also experimented with new lighting arrangements in the concert hall, at one point conducting in a dark hall with only his head and hands lighted, at other times arranging the lights so they would cast theatrical shadows of his head and hands. Late in the 1929-1930 symphony season, Stokowski started conducting without a baton. His free-hand manner of conducting soon became one of his trademarks. On the musical side, Stokowski nurtured the orchestra and shaped the "Stokowski" sound, or what became known as the "Philadelphia Sound". He encouraged "free bowing" from the string section, "free breathing" from the brass section, and continually altered the seating arrangements of the orchestra's sections, as well as the acoustics of the hall, in response to his urge to create a better sound. Stokowski is credited as the first conductor to adopt the seating plan that is used by most orchestras today, with first and second violins together on the conductor's left, and the violas and cellos to the right. Stokowski also became known for modifying the orchestrations of some of the works that he conducted, as was a standard practice for conductors prior to the second half of the 20th Century. Among others, he amended the orchestrations of Beethoven, Tchaikovsky, Sibelius, Johann Sebastian Bach, and Brahms. For example, Stokowski revised the ending of the Romeo and Juliet Fantasy Overture, by Tchaikovsky, so it would close quietly, taking his notion from Modest Tchaikovsky's Life and Letters of Peter Ilych Tchaikovsky (translated by Rosa Newmarch: 1906) that the composer had provided a quiet ending of his own at Balakirev's suggestion. Stokowski made his own orchestration of Mussorgsky's Night on Bald Mountain by adapting Rimsky-Korsakov's orchestration and making it sound, in some places, similar to Mussorgsky's original. In the film Fantasia, to conform to the Disney artists' story-line, depicting the battle between good and evil, the ending of Night on Bald Mountain segued into the beginning of Schubert's Ave Maria. 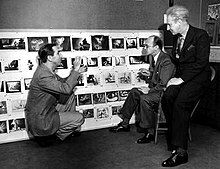 Walt Disney (kneeling on left) acting out a scene in The Sorcerer's Apprentice segment in Fantasia, with Leopold Stokowski, sitting on the right, and Deems Taylor, sitting second from right. Many music critics have taken exception to the liberties Stokowski took—liberties which were common in the nineteenth century, but had mostly died out in the twentieth, when faithful adherence to the composer's scores became more common. Stokowski's repertoire was broad and included many contemporary works. He was the only conductor to perform all of Arnold Schoenberg's orchestral works during the composer's own lifetime, several of which were world premieres. Stokowski gave the first American performance of Schoenberg's Gurre-Lieder in 1932. It was recorded "live" on 78 rpm records and remained the only recording of this work in the catalogue until the advent of the LP Record. Stokowski also presented the American premieres of four of Dmitri Shostakovich's symphonies, Numbers 1, 3, 6, and 11. In 1916, Stokowski conducted the American premiere of Mahler's 8th Symphony, Symphony of a Thousand. He added works by Rachmaninoff to his repertoire, giving the world premieres of his Fourth Piano Concerto, the Three Russian Songs, the Third Symphony, and the Rhapsody on a Theme of Paganini; Sibelius, whose last three symphonies were given their American premieres in Philadelphia in the 1920s; and Igor Stravinsky, many of whose works were also given their first American performances by Stokowski. In 1922, he introduced Stravinsky's score for the ballet The Rite of Spring to America, gave its first staged performance there in 1930 with Martha Graham dancing the part of The Chosen One, and at the same time made the first American recording of the work. Seldom an opera conductor, Stokowski did give the American premieres in Philadelphia of the original version of Mussorgky's Boris Godunov (1929) and Alban Berg's Wozzeck (1931). Works by such composers as Arthur Bliss, Max Bruch, Ferruccio Busoni, Carlos Chávez, Aaron Copland, George Enescu, Manuel de Falla, Paul Hindemith, Gustav Holst, Gian Francesco Malipiero, Nikolai Myaskovsky, Walter Piston, Francis Poulenc, Sergei Prokofiev, Maurice Ravel, Ottorino Respighi, Albert Roussel, Alexander Scriabin, Elie Siegmeister, Karol Szymanowski, Edgard Varèse, Heitor Villa-Lobos, Anton Webern, and Kurt Weill, received their American premieres under Stokowski's direction in Philadelphia. In 1933, he started "Youth Concerts" for younger audiences, which are still a tradition in Philadelphia and many other American cities, and fostered youth music programs. After disputes with the board, Stokowski began to withdraw from involvement in the Philadelphia Orchestra from 1936 onwards, allowing his co-conductor Eugene Ormandy to gradually take over. Stokowski shared principal conducting duties with Ormandy from 1936 to 1941; Stokowski did not appear with the Philadelphia Orchestra from the closing concert of the 1940-41 season (a semi-disastrous performance of Bach's St. Matthew Passion) until 12 February 1960, when he guest-conducted the Philadelphia in works of Mozart, de Falla, Respighi, and in a legendary performance of the Shostakovich Fifth Symphony, arguably the greatest by Stokowski. The recording of this concert's broadcast had been circulated privately among collectors over the years, though never issued commercially, but with the copyright expiring at the start of 2011, it was released in its entirety on the Pristine Audio label. Stokowski appeared as himself in the motion picture The Big Broadcast of 1937, conducting two of his Bach transcriptions. That same year he also conducted and acted in One Hundred Men and a Girl, with Deanna Durbin and Adolphe Menjou. In 1939, Stokowski collaborated with Walt Disney to create the motion picture for which he is best known: Fantasia. He conducted all the music (with the exception of a "jam session" in the middle of the film) and included his own orchestrations for the Toccata and Fugue in D minor and Night on Bald Mountain/Ave Maria segments. Stokowski even got to talk to (and shake hands with) Mickey Mouse on screen, although he would later say with a smile that Mickey Mouse got to shake hands with him. This footage of Stokowski was incorporated into Fantasia 2000. A lifelong and ardent fan of the newest and most experimental techniques in recording, Stokowski saw to it that most of the music for Fantasia was recorded over Class A telephone lines laid down between the Academy of Music in Philadelphia and Bell Laboratories in Camden NJ, using an early, highly complex version of multi-track stereophonic sound, dubbed Fantasound, which shared many attributes with the later Perspecta stereophonic sound system. Recorded on photographic film, the only suitable medium then available, the results were considered astounding for the latter half of the 1930s. Upon his return in 1960, Stokowski appeared with the Philadelphia Orchestra as a guest conductor. He also made two LP recordings with them for Columbia Records, one including a performance of Manuel de Falla's El amor brujo, which he had introduced to America in 1922 and had previously recorded for RCA Victor with the Hollywood Bowl Symphony Orchestra in 1946, and a Bach album which featured the 5th Brandenburg Concerto and three of his own Bach transcriptions. He continued to appear as a guest conductor on several more occasions, his final Philadelphia Orchestra concert taking place in 1969. In honour of Stokowski's vast influence on music and the Philadelphia performing arts community, on 24 February 1969, he was awarded the prestigious University of Pennsylvania Glee Club Award of Merit. Beginning in 1964, this award was "established to bring a declaration of appreciation to an individual each year that has made a significant contribution to the world of music and helped to create a climate in which our talents may find valid expression." With his Philadelphia Orchestra contract having expired in 1940, Stokowski immediately formed the All-American Youth Orchestra, its players' ages ranging from 18 to 25. It toured South America in 1940 and North America in 1941 and was met with rave reviews. Although Stokowski made a number of recordings with the AAYO for Columbia, the technical standard was not as high as had been achieved with the Philadelphia Orchestra for RCA Victor. In any event, the AAYO was disbanded when America entered the Second World War, and plans for another extensive tour in 1942 were abandoned. During this time, Stokowski also became chief conductor of the NBC Symphony Orchestra on a three-year contract (1941–1944). The NBC's regular conductor, Arturo Toscanini, did not wish to undertake the 1941-42 NBC season because of friction with NBC management, though he did accept guest engagements with the Philadelphia Orchestra. Stokowski conducted a great deal of contemporary music with the NBC Symphony, including the US premiere of Prokofiev's Alexander Nevsky in 1943, the world premieres of Schoenberg's Piano Concerto (with Eduard Steuermann) and George Antheil's 4th Symphony, both in 1944, and new works by Alan Hovhaness, Stravinsky, Hindemith, Milhaud, Howard Hanson, William Schuman, Morton Gould and many others. He also conducted several British works with this orchestra, including Vaughan Williams' 4th Symphony, Holst's The Planets, and George Butterworth's A Shropshire Lad. Stokowski also made a number of recordings with the NBC Symphony for RCA Victor in 1941-42, including Tchaikovsky's 4th Symphony, a work which was never in Toscanini's repertoire, and Stravinsky's Firebird Suite. Toscanini returned as co-conductor of the NBC Symphony with Stokowski for the remaining two years of the latter's contract. In 1944, on the recommendation of Mayor Fiorello La Guardia, Stokowski helped form the New York City Symphony Orchestra, which they intended would make music accessible for middle-class workers. Ticket prices were set low, and performances took place at convenient, after-work hours. Many early concerts were standing room only; however, a year later in 1945, Stokowski was at odds with the board (who wanted to trim expenses even further) and he resigned. Stokowski made three 78pm sets with the New York City Symphony for RCA Victor: Beethoven's 6th Symphony, Richard Strauss's Death and Transfiguration, and a selection of orchestral music from Georges Bizet's Carmen. In 1945, he founded the Hollywood Bowl Symphony Orchestra. The orchestra lasted for two years before it was disbanded for live concerts, but not for recordings, which continued well into the 1960s. Stokowski's own recordings (made in 1945-46) included Brahms's 1st Symphony, Tchaikovsky's Pathetique Symphony and a number of short popular pieces. Some of Stokowski's open-air HBSO concerts were broadcast and recorded, and have been issued on CD, including a collaboration with Percy Grainger on Edvard Grieg's Piano Concerto in A minor in the summer of 1945. (It began giving live concerts again as the "Hollywood Bowl Orchestra" in 1991, under John Mauceri). There was a 1949 cartoon spoof of Stokowski at the Bowl with Bugs Bunny playing the conductor in "Long-Haired Hare" by Chuck Jones. He continued to appear frequently with the Los Angeles Philharmonic, both at the Hollywood Bowl and other venues. Then in 1946 Stokowski became a chief Guest Conductor of the New York Philharmonic. His many "first performances" with them included the US Premiere of Prokofiev's 6th Symphony in 1949. He also made many splendid recordings with the NYPO for Columbia, including the world premiere recordings of Vaughan Williams's 6th Symphony and Olivier Messiaen's L'Ascension, also in 1949. However, when in 1950 Dimitri Mitropoulos was appointed Chief Conductor of the NYPO, Stokowski began a new international career which commenced in 1951 with a nationwide tour of England: during the Festival of Britain celebrations he conducted the Royal Philharmonic Orchestra at the invitation of Sir Thomas Beecham. It was during this first visit that he made his debut recording with a British orchestra, the Philharmonia, of Rimsky-Korsakov's Scheherazade. During that same summer he also toured and conducted in Germany, Holland, Switzerland, Austria, and Portugal, establishing a pattern of guest-conducting abroad during the summer months while spending the winter seasons conducting in the USA. This scheme was to hold good for the next 20 years during which Stokowski conducted many of the world's greatest orchestras, simultaneously making recordings with them for various labels. Thus he conducted and recorded with the main London orchestras as well as the Berlin Philharmonic, the Suisse Romande Orchestra, the French National Radio Orchestra, the Czech Philharmonic, the Hilversum (Netherlands) Radio Philharmonic, et al. Stokowski returned to the NBC Symphony Orchestra in 1954 for a series of recording sessions for RCA Victor. The repertoire included Beethoven's 'Pastoral' Symphony, Sibelius's 2nd Symphony, Acts 2 and 3 of Tchaikovsky's Swan Lake and highlights from Saint-Saëns's Samson and Delilah with Risë Stevens and Jan Peerce. After the NBC Symphony Orchestra was disbanded as the official ensemble of the NBC radio network, it was re-formed as the Symphony of the Air with Stokowski as notional Music Director, and as such performed many concerts and made recordings from 1954 until 1963. The US premiere in 1958 of Turkish composer Adnan Saygun's Yunus Emre Oratorio is among them. He made a series of Symphony of the Air recordings for the United Artists label in 1958 which included Beethoven's 7th Symphony, Shostakovich's 1st Symphony, Khatchaturian's 2nd Symphony and Respighi's The Pines of Rome. From 1955 to 1961, Stokowski was also the Music Director of the Houston Symphony Orchestra. For his debut appearance with the orchestra he gave the first performance of Mysterious Mountain by Alan Hovhaness – one of many living American composers whose music he championed over the years. He also gave the US premiere in Houston of Shostakovich's 11th Symphony (7 April 1958) and made its first American recording on the Capitol label. In 1960, Stokowski made one of his infrequent appearances in the opera house, when he conducted Giacomo Puccini's Turandot at the New York Metropolitan, in memorable performances with a cast that included Birgit Nilsson, Franco Corelli and Anna Moffo. At the New York City Opera, he had led double-bills of Œdipus rex (with Richard Cassilly) and Carmina burana (1959), as well as L'Orfeo (with Gérard Souzay) and Il prigioniero (with Norman Treigle, 1960). In 1962, at the age of 80, Stokowski founded the American Symphony Orchestra. His championship of the 20th-century composer remained undiminished, and perhaps his most celebrated premiere with the American Symphony Orchestra was of Charles Ives's 4th Symphony in 1965, which CBS also recorded. Stokowski served as Music Director for the ASO until May 1972 when, at the age of 90, he returned to live in England. On 3 January 1962, still showing his interest in using technological innovation, he was featured in a telecast for WGN-TV conducting the Chicago Symphony Orchestra, which has since been recorded on DVD. One of his notable British guest conducting engagements in the 1960s was the first Proms performance of Gustav Mahler's Second Symphony, Resurrection, since issued on CD. He continued to conduct in public for a few more years, but failing health forced him to only make recordings. An eyewitness said that Stokowski often conducted sitting down in his later years; sometimes, as he became involved in the performance, he would stand up and conduct with remarkable energy. His last public appearance in the UK took place at the Royal Albert Hall, London, on 14 May 1974. Stokowski conducted the New Philharmonia in the 'Merry Waltz' of Otto Klemperer (in tribute to the orchestra's former Music Director who had died the previous year), Vaughan Williams's Fantasia on a Theme of Thomas Tallis, Ravel's Rapsodie espagnole and Brahms's 4th Symphony. His very last public appearance took place during the 1975 Vence Music Festival in the South of France, when, on 22 July 1975, he conducted the Rouen Chamber Orchestra in several of his Bach transcriptions. Stokowski gave his last world premiere in 1973 when, at the age of 91, he conducted Havergal Brian's 28th Symphony in a BBC radio broadcast with the New Philharmonia Orchestra. In August 1973, Stokowski conducted the International Festival Youth Orchestra at Royal Albert Hall in London, performing Tchaikovsky's Fifth Symphony. Edward Greenfield of The Guardian wrote: "Stokowski rallied them as though it was a vintage Philadelphia concert of the 1920s". Stokowski continued to make recordings even after he had retired from the concert platform, mainly with the National Philharmonic, another 'ad hoc' orchestra made up of first-desk players chosen from the main London orchestras. In 1976, he signed a recording contract with Columbia Records that would have kept him active until he was 100 years old. Stokowski died of a heart attack in 1977 in Nether Wallop, Hampshire, at the age of 95. His very last recordings, made shortly before his death, for Columbia, included performances of the youthful Symphony in C by Georges Bizet and Felix Mendelssohn's 4th Symphony, "Italian", with the National Philharmonic Orchestra in London. He is interred at East Finchley Cemetery. Stokowski made his very first recordings, with the Philadelphia Orchestra, for the Victor Talking Machine Company in October 1917, beginning with two of Brahms' Hungarian Dances. Other works recorded in the early sessions were the scherzo from Mendelssohn's A Midsummer Night's Dream incidental music and "Dance of the Blessed Spirits" from Gluck's Orfeo ed Euridice. He found ways to make the best use of the acoustical process, until electrical recording was introduced by Victor in the spring of 1925. He conducted the first orchestral electrical recording to be made in America (Saint-Saëns's Danse Macabre) in April 1925. The following month Stokowski recorded Marche Slave by Tchaikovsky, in which he increased the double basses to best utilise the lower frequencies of early electrical recording. Stokowski was also the first conductor in America to record all four Brahms symphonies (between 1927 and 1933). Stokowski made the first US recordings of the Beethoven 7th and 9th Symphonies, Antonín Dvořák's New World Symphony, Tchaikovsky's 4th Symphony and Nutcracker Suite, César Franck's Symphony in D minor, Rimsky-Korsakov's Scheherazade, Rachmaninoff's 2nd Piano Concerto (with the composer as soloist), Sibelius's 4th Symphony (its first recording), Shostakovich's 5th and 6th Symphonies, and many shorter works. His early recordings were made at Victor's Trinity Church studio in Camden, New Jersey until 1926, when Victor began recording the orchestra in the Academy of Music in Philadelphia. Stokowski and the Philadelphia Orchestra later participated in long playing, high fidelity, and stereophonic experiments, during the early 1930s, mostly for Bell Laboratories. (Victor even released some early LPs at this time, which were not commercially successful because they required special, expensive phonographs that most people could not afford during the Great Depression.) Stokowski continued to make recordings with the Philadelphia Orchestra for Victor through December 1940. One of his last 1940 sessions was the world premiere recording of Shostakovich's sixth symphony. In addition to RCA Victor, Stokowski recorded prodigiously for several other labels until shortly before his death, including Columbia, Capitol, Everest, United Artists, and Decca/London 'Phase 4' Stereo. His first commercial stereo recordings were made in 1954 for RCA Victor with the NBC Symphony Orchestra, devoted to excerpts from Prokofiev's ballet Romeo and Juliet and the complete one-act ballet Sebastian by Gian Carlo Menotti. From 1947 to 1953 Stokowski recorded for RCA Victor with a specially assembled 'ad hoc' band of players drawn principally from the New York Philharmonic and NBC Symphony. The LPs were labelled as being played by 'Leopold Stokowski and His Symphony Orchestra' and the repertoire ranged from Haydn (his Imperial Symphony) to Schoenberg (Transfigured Night) by way of Schumann, Liszt, Bizet, Wagner, Tchaikovsky, Debussy, Vaughan Williams, Sibelius and Percy Grainger. His Capitol recordings in the 1950s were distinguished by the use of three-track stereophonic tape recorders. Stokowski was very careful in the placement of musicians during the recording sessions and consulted with the recording staff to achieve the best possible results. Some of the sessions took place in the ballroom of the Riverside Plaza Hotel in New York City in January and February 1957; these were produced by Richard C. Jones and engineered by Frank Abbey with Stokowski's own orchestra, which was typically drawn from New York musicians (primarily members of the Symphony of the Air). The CD reissue by EMI included selections originally released on two LPs -- The Orchestra and Landmarks of a Distinguished Career—and featured music of Dukas, Barber, Richard Strauss, Harold Farberman, Vincent Persichetti, Tchaikovsky, Mussorgsky, Debussy, Bach (as arranged by Stokowski), and Sibelius. Although he officially used the Ravel orchestration of the finale to Mussorgsky's Pictures at an Exhibition in his 1957 Capitol recording, he did add a few additional percussion instruments to the score. His Capitol recording of Holst's The Planets was made with the Los Angeles Philharmonic Orchestra. EMI, which acquired Capitol and Angel Records in the 1950s, has reissued many of Stokowski's Capitol recordings on CD. All of the music that Stokowski conducted in Fantasia was released on a 3-LP set by Disneyland Records, in the 1957 soundtrack album made from the film. After stereo became possible on phonograph records, the album was released in stereo on Buena Vista Records. With the advent of compact discs, it appeared on a 2-CD Walt Disney Records set, in conjunction with the film's 50th anniversary. Other labels for which Stokowski recorded in the late 1950s included Everest, noted for its use of 35 mm film instead of tape and the resulting highly vivid sound. The most notable of which was a coupling of Tchaikovsky's Francesca da Rimini and Hamlet with Stokowski conducting the New York Stadium Symphony Orchestra (the summer name for the New York Philharmonic). Other remarkable Everest recordings of Stokowski conducting the New York Stadium Symphony Orchestra are Villa-Lobos' tone poem Uirapuru, Shostakovich's Symphony No. 5 and Prokofiev's ballet suite Cinderella. Several of Stokowski's televised concerts have appeared on both Video and DVD, including Beethoven's 5th Symphony and Schubert's Unfinished with the London Philharmonic on EMI Classics 'Classic Archive' label; the Nielsen 2nd Symphony with the Danish Radio Orchestra on VAI (Video Artists International); and the Ives 4th Symphony with the American Symphony Orchestra on Classical Video Rarities. In 1973, aged 91, he was invited by the International Festival of Youth Orchestras to conduct the 1973 International Festival Orchestra, numbering 140 of the world's finest young musicians, in a performance of Tchaikovsky's Fifth Symphony at the Royal Albert Hall, London. The Cameo Classics LP label recorded the concert, and also, by special permission of the maestro, the final rehearsals, which would make up a 2-LP set. Edward Greenfield in The Guardian reported "Stokowski rallied them as though it was a vintage Philadelphia concert of the 1920s". Robert M. Stumpff ll (Leopold Stokowski Club of America) called the performance "The finest ever performance of this symphony". This unique Dolby recording was restored in 2014 by Klassik Haus and is available from Cameo Classics on CD (Nimbus Records Distribution). His first wife was American concert pianist Olga Samaroff (born Lucy Hickenlooper), to whom he was married from 1911 until 1923. They had one daughter: Sonya Maria Noel Stokowski (born 24 December 1921), an actress, who married Willem Thorbecke and settled in the US with their four children, Noel, Johan, Leif and Christine. His second wife was Johnson & Johnson heiress Evangeline Love Brewster Johnson (1897–1990), an artist and aviator, to whom he was married from 1926 until 1937 (two daughters: Gloria Luba Stokowski and Andrea Sadja Stokowski). In March 1938, Stokowski vacationed with Greta Garbo on the island of Capri in Italy. This followed other reports of friendship or romance between Stokowski and Garbo. Subsequently, Stokowski and Evangeline were divorced. Evangeline later married Prince Zalstem-Zalessky, a descendant of a Russian noble family who died in 1965, while Evangeline died at age 93 on 17 June 1990. Stokowski's third wife (1945–1955) was heiress and actress Gloria Vanderbilt (born 1924), by whom he had two sons, Leopold Stanislaus Stokowski (born 1950) and Christopher Stokowski (born 1952). After he had achieved international fame with the Philadelphia Orchestra, unsubstantiated rumours circulated that he was born "Leonard" or "Lionel Stokes" or that he had "anglicised" it to "Stokes"; this canard is readily disproved by reference not only to his birth certificate and those of his father, younger brother, and sister (which show Stokowski to have been the genuine polonised Lithuanian family name, original Stokauskas where stoka means "lack" or "shortage"), but also by the Student Entry Registers of the Royal College of Music, Royal College of Organists, and The Queen's College, Oxford, along with other surviving documentation from his days at St. Marylebone Church, St. James's Church, and St. Bartholomew's in New York City. 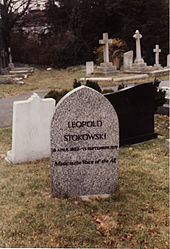 Stokowski's grave at East Finchley Cemetery. After Stokowski's death, Tom Burnam writes, the "concatenization of canards" that had arisen around him was revived — that his name and accent were phony; that his musical education was deficient; that his musicians did not respect him; that he cared about nobody but himself. Burnam suggests that there was a dark, hidden reason for these rumours. Stokowski deplored the segregation of symphony orchestras in which women and minorities were excluded, and, so Burnam claims, his detractors got revenge by slandering Stokowski. Nevertheless, and notwithstanding the claims made by Tom Burnam, attitudes towards Stokowski have changed dramatically over the years since his death. In 1999, for Gramophone magazine, the noted music commentator David Mellor wrote: "One of the great joys of recent years for me has been the reassessment of Leopold Stokowski. When I was growing up there was a tendency to disparage the old man as a charlatan. Today it is all very different. Stokowski is now recognised as the father of modern orchestral standards. He possessed a truly magical gift of extracting a burnished sound from both great and second-rank ensembles. He also loved the process of recording and his gramophone career was a constant quest for better recorded sound. But the greatest pleasure of all for me is his acceptance now as an outstanding conductor of nineteenth- and twentieth-century music, including a lot that was at the cutting edge of contemporary achievement." The Looney Tunes episode "Long-Haired Hare" has a satirical homage to Leopold when Bugs Bunny impersonates him at the opera. ^ Simon Callow (23 September 2005). "He would fix the audience with his glinting eye..." The Guardian. Retrieved 11 April 2007. ^ Smith, Rollin (2004). Stokowski and the Organ. Pendragon Press. p. 17. ^ David Lasserson (19 July 2002). "Are concerts killing music?". The Guardian. Retrieved 11 April 2007. ^ David Patrick Stearns (26 January 2007). "Leopold Stokowski, the father of the Philadelphia Sound". The Philadelphia Inquirer. Retrieved 11 April 2007. ^ Preben Opperby, Leopold Stokowski, Great Performers, Tunbridge Wells, Kent: Midas / New York: Hippocrene, 1982, ISBN 9780882546582, p. 127, reproduces four of Stokowski's seating plans, of which illustration No. 2 shows the string sections as here described. ^ Schonberg, Harold C. (1967). The Lives of the Great Composers. New York: Simon and Schuster. ISBN 0-393-02146-7. ^ "The University of Pennsylvania Glee Club Award of Merit Recipients". Archived from the original on 9 February 2012. ^ "Hollywood Bowl Orchestra". Archived from the original on 13 December 2007. Retrieved 1 January 2008. ^ "History of the Hollywood Bowl". Archived from the original on 22 July 2010. Retrieved 1 January 2008. ^ Edward Greenfield (13 February 2004). "Mahler: Symphony No. 2, Woodland/ Baker/ BBC Chorus and Choral Soc/ LSO/ Stokowski". The Guardian. Retrieved 11 April 2007. ^ Paul Vaughan (13 March 2002). "Age cannot wither them". The Guardian. Retrieved 11 April 2007. ^ Davis, Peter G. (19 September 1977). "Prolific and Pulsating Legacy Of Stokowski Remains on Disk" – via NYTimes.com. ^ Allen Hughes, "Leopold Stokowski Is Dead of a Heart Attack at 95", The New York Times, 14 September 1977. ^ East Finchley Cemetery infosite, westminster.gov.uk; accessed 21 July 2014. ^ Fox, Barry (24–31 December 1981) "A hundred years of stereo: fifty of hi-fi", Scientific American, pp 910–911; retrieved 1 March 2012. ^ Larry Huffman. "Leopold Stokowski Biography". The Stokowski Legacy. Retrieved 1 November 2016. ^ Knight, John (1996). "Leopold Stokowski Explores Debussy's Orchestral Colors". The Instrumentalist. 50 (9). 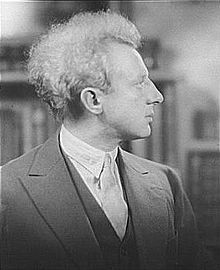 Wikimedia Commons has media related to Leopold Stokowski.